Q.1 Which term of the AP : 121, 117, 113....., is its first negative terms? The first negative term is 32nd term. Q.2 The sum of the third and the seventh terms of an AP is 6 and their product is 8. Find the sum of first sixteen terms of the AP. 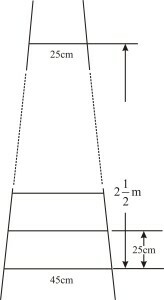 Q.3 A ladder has rungs 25 cm apart (see figure). The rungs decrease uniformly in length from 45 cm, at the bottom to 25 cm at the top. If the top and the bottom rungs are m apart, what is the length of the wood required for the rungs? Q.4 The houses of a row are numbered consecutively from 1 to 49. Show that there is a value of x such that the sum of the numbers of the houses preceding the house numbered x is equal to the sum of the numbers of the houses following it. Find this value of x. Since x is a counting number , so taking positive square root, x = 7 × 5 = 35. Q.5 A small terrace at a football ground comprises of 15 steps each of which is 50 m long and built of solid concrete. Each step has a rise of and a tread of (see figure). Calculate the total volume of concrete required to build the terrace. Therefore Total volume of concrete required. A bit different to understand the method, you must make it more easy ! Fine..nothing much to say ! !